Being the leader in cloud native storage containers, Portworx have worked with customers running all kinds of apps in production. 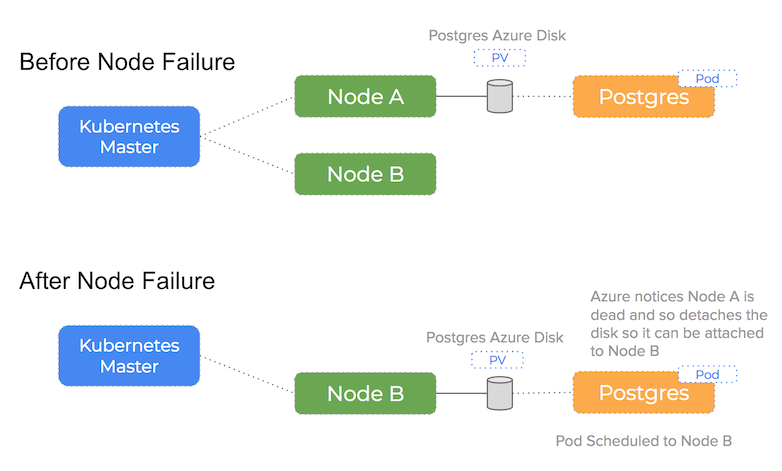 One of the most frequent errors we see from our customers are Failed Attach Volume and Failed Mount which can occur when using Azure Disk volumes with Kubernetes. This post zooms in on errors that can happen when a node in your cluster fails. In this case, the Kubernetes master can no longer assert the health of the node and the pod will be re-scheduled to another node which can result in Failed Attach Volume and Failed Mount warnings. 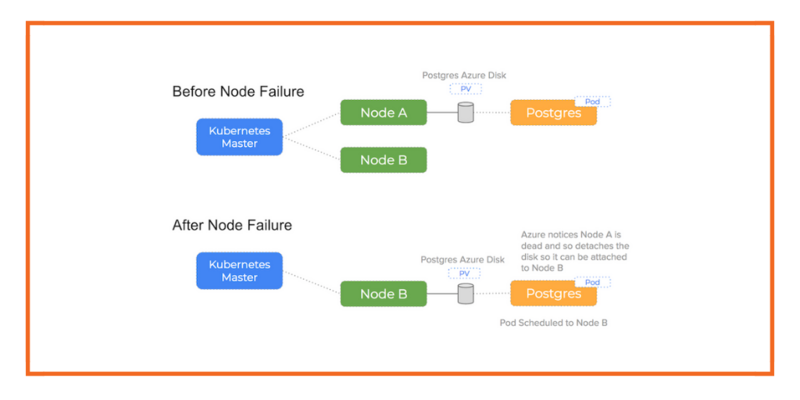 We tested how k8s deals with an Azure node going away so we can learn how to avoid downtime that can occur when we have a kernel panic or other disaster (such as a power cut). These errors are hard to simulate so we used the Azure console to delete the node and watched what happened. In this special case of node failure, K8s responds properly because Azure does a force detach because we are in effect giving it warning that the node is no longer is use. However, that is not a real world scenario since most often, Azure doesn’t get such a warning and doesn’t force detach a block device..
It’s an important fact to consider that the way in which we simulated a node failure is not representative of a real-world use case. Each of these failure modes don’t provide Azure with permission to force-detach the disks because it was not an intentional action and so Azure would not perform the force detach operation that is needed to free the disk and allow it to be moved. When it comes to production disks, it is always better to be cautious! By deleting the node using the Azure console – we are marking each of the Azure disks as available which in turn allows the Kubernetes controller to proceed and attach it to the new node. MountVolume.SetUp succeeded for volume "pvc-7559c82f-27f5-11e8-bbb9-0022480128db"
failed to get azure instance id for node "k8s-agent-24653059-0"
This sequence is the same as the sequence of commands we would have to apply if unpicking this problem manually.